The NYC Health Department has published rules in the City Record for the new letter grading program for food carts and trucks, which will launch in December. This program introduces a scoring system similar to that used in restaurants. 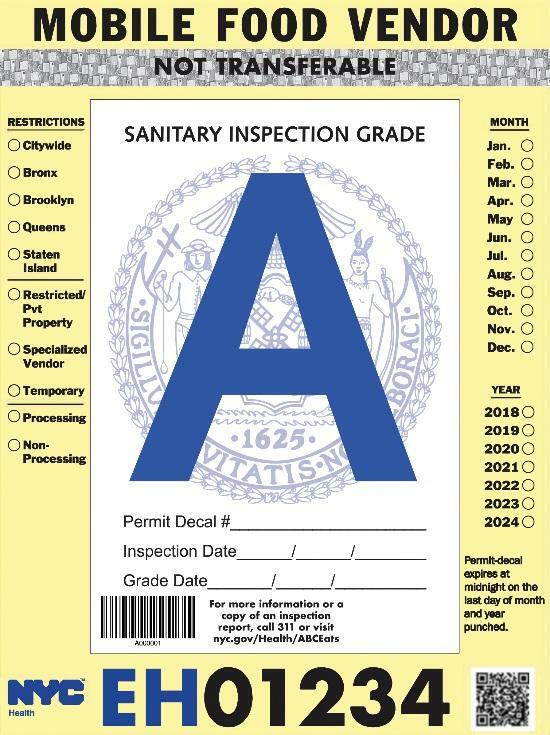 Mobile food vendors will now receive points for violations at their food safety inspections, and their total inspection score will correspond to an “A”, “B” or “C” grade, which will be posted on the unit. The new letter grading program will apply to all 5,500 food carts and trucks authorized to operate in New York City and is required under last year’s Local Law 108. In order to locate carts and trucks when they are due for inspection, the Health Department will attach a location-sharing device on every unit. These data will only be accessible to Health Department staff or agents of the Department, and they will be protected from disclosure in all instances except where ordered by a court. Food carts and trucks will also be getting new permit decals that can accommodate the letter grade. It will take two years for all carts and trucks to be graded, similar to the rollout for restaurant grading in 2010. The Department further detailed the precautions it will take to protect the cart and truck location information. Specifically, the Department will delete all location data within 24 hours; protect data during transmission and storage; and make the location-sharing device identification number different from the unit’s permit, decal and license number. In addition, the Department will “ask” the device for the location information only when the food cart or truck is due for inspection. “I cannot imagine someone not looking for a restaurant’s letter grade from our city’s Health Department before deciding whether or not to patronize a restaurant. The letter grade has become absolutely essential as it relates to restaurants. Yet, every day, countless numbers of people in New York purchase food from a street vendor without knowing to a general degree the cart’s compliance with the NYC Health Code. I believe that the customers who buy food from a street vendor deserve to have the same ability to make an informed decision as do patrons of restaurants,” said Council Member Karen Koslowitz, prime sponsor of the law requiring letter grades for mobile food vendors. “New Yorkers are known around the world for always being on the go – and New York is known around the world for the amazing diversity of its street food, ranging from halal hot dogs to curry in a hurry. But everyone celebrating that diversity has a right to know that it meets uniform health standards, and the Health Department is right to implement a letter grading system for food carts and trucks to help assure that those standards are met,” said Assembly Member Richard N. Gottfried, Chair of the Assembly Committee on Health. The Health Department will host several food safety education workshops for mobile food vendors in the coming months. Participants will learn about the new grading program and review how to prepare and handle food safely and avoid common violations. The workshop dates and locations will soon be posted on the Health Department’s website at nyc.gov/health/foodservice. In July 2010, the Health Department began issuing letter grades to restaurants. Ninety-one percent of New Yorkers approve of restaurant grading, and 88 percent use letter grades to make dining decisions.